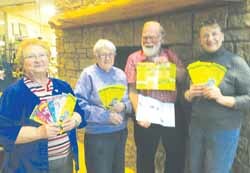 The weather chatter surfaced at a meeting of some of the people who lead the summertime Langlade County Music in the Park program, who were celebrating the printing of the advertising material that promotes the popular programs that operate in Antigo, White Lake, and Elcho. Hospital to distribute programs for the upcoming season and discuss plans. Judy Peterson, who steers the program in White Lake. His list showed they will be good times with many of the favorites back on the Antigo park bandstand and the museum at White Lake and the community pavilion at Elcho. MAY - starts at 6:30 p.m.
May 29 - Elcho: Elcho School Band, variety. JUNE - start at 6:30 p.m.
June 3 - Antigo: Antigo Jazz Band, sponsored by Brickners of Antigo. June 5 - Elcho: Slidin' On Ice, variety. June 6 - Antigo: The Silhouettes Country, sponsored by Gilbert's Sentry Foods. June 10 - Antigo: Northern Aires, variety, sponsored by Parson's of Antigo. June 13 - Antigo: Of Chorus and Fast Times, variety, sponsored by Antigo Elks Club and Northern Advertising (Dean and Polly Blazek). June 17 - Antigo: Quarry Road, variety, sponsored by Dixie Lunch and Fifth Avenue. June 18 - White Lake, 6 p.m.: Quarry Road, sponsored by White Lake Historical Society. June 19 - Elcho: Lovin Country. June 20 - Antigo: Country Risc, sponsored by Dr. Stanley Brown DDS. June 24 - Antigo: Elvis Tribute and Hayek Family, classic rock, sponsored by The Green Hen, Natural Living Market. June 27 - Antigo: The Drovers, country, sponsored by Antigo Dental Clinic � Dr. Meghan O'Brien. JULY - start at 6:30 p.m.
July 1 - Antigo: Hip Pocket, R&B rock, sponsored by Aspirus Langlade Hospital. July 3 - Elcho: Quarry Road, variety. July 4 - Antigo High School: Antigo Community Band, variety, sponsored by music donors. July 6 - White Lake: Lovin Country, 1 to 3 p.m. and Dark Horse, 5 to 9 p.m., sponsored by White Lake Parade committee. July 8 - Antigo: Rocker, variety, sponsored by Antigo Complete Dental - Dr. Aaron Gubler. July 11 - Antigo: Stone Soup Brothers, variety, sponsored by Antigo Junior Women's Club. July 15 - Antigo: Antigo Community Band, variety, in memory of Mary Rennpferd. July 16 - White Lake at 6 p.m.: The Silhouettes, country, sponsored by White Lake Historical Society. July 16 - Antigo High School's Volm Theater: Kids from Wisconsin, variety, sponsored by Rotary Club. July 17 - Elcho: String Fever. July 18 - Antigo: Thunder Country, sponsored by Antigo Optimist. July 22 - Antigo: Lyles Band and More, variety, sponsored by Dairy Queen. July 29 - Antigo: Foxfire, country, sponsored by Strasser-Roller Funeral Home and Evergreen Assisted Living. July 31 - Elcho: Bear Creek Band, variety. AUGUST - start at 6:00 p.m.
Aug. 1 - Antigo: Second Edition, variety, sponsored by John Lipnski family and Cousineau's Auto. Aug. 5 - Antigo: MLC Blues, sponsored by Johnson Electric & Coil Inc.
Aug. 7 - Elcho: Fran the Piano Man, variety. Aug. 8 - Antigo: Dig Deep, classic rock, sponsored by Fred Berner and Kay Schroeder. Aug. 12 - Antigo: Sundowners, variety, sponsored by Cirrnity/Wittenberg Phone. Aug. 15 - Antigo: Lovin' Country, variety/country, sponsored by Shroeders (in memory of John). Aug. 19 - Antigo: Slidin' on Ice, sponsored by Dede Cromer. Aug. 21 - Elcho: Bobby Vintage, variety. Aug. 21 - White Lake at 6 p.m.: Lovin' Country, variety/country, sponsored by White Lake Historical Society. Aug. 22 - Antigo: Max Koepke, sponsored by music donors. Aug. 26 - Antigo: Bear Creek Band, variety, sponsored by Amron division of AMTEC. Aug. 29 - Antigo: Ramblin Fever, variety, sponsored by Fuller Sales & Service.